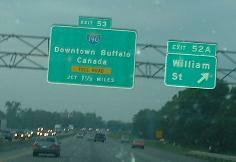 Not too long ago, tolls were removed from I-190 (the Niagara Section of the Thruway) to keep commuter and tourist traffic moving through Buffalo. The section of I-90 between US 219 and I-290 has always been free for that reason. So the legend "TOLL" or "TOLL ROAD" was greened out next to I-190, and at the same time NYSDOT decided it would be more informative to list Niagara Falls as a destination versus Canada. I agree. Then they changed something on the I-90 sign as well. But since Rochester is the next city and Albany is always listed as a destination from here eastward, what would have been here before? New York City? WB at I-190 when it was still a toll road, courtesy Doug Kerr, and then the last exit before I-90 resumes being tolled. 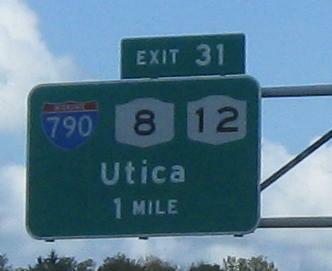 Notice that exit numbers increase heading westbound because Exit 1 on the Thruway is at the New York City line. Some older but not button-copy signs, with consecutive identical assemblies. The first Exit 50A BGS should have had a "1/4 MILE" or "NEXT RIGHT". In an EB rest area past Exit 48A. Under NY 64, to the southeast of Rochester. The next six photos are courtesy Doug Kerr. Another beginning - like in California, Interstates transmogrify into state routes all the time in NY, although this change in direction is unusual (then again, it happens on such routes as NY 7 which don't transmogrify). First photo is westbound, and the second photo is on the ramp from I-90 (post-toll, so both EB and WB traffic sees this). Speak of the devil... not sure which direction this was taken. 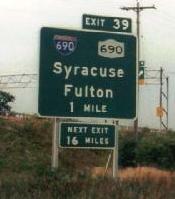 Off Exit 34A, still in Syracuse - I-481 was built after the Thruway, hence the suffixed exit. The second photo is in the same place as the first, but the sign on the right has been replaced and the one on the left is probably next. Hey Mister Contractor, they didn't give you all that space for nothing! Two of my photos, mainline eastbound button copy still out there. 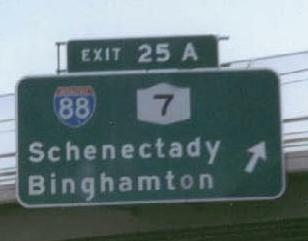 I-790/NY 5 flanks the Thruway on either side with more button copy, so there should be an NY 5 shield here as well. 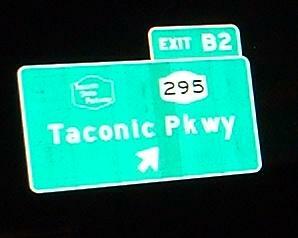 Past the tolls on Exit 31, which is for I-790 as well as NY 5, 8, and 12, courtesy Doug Kerr. 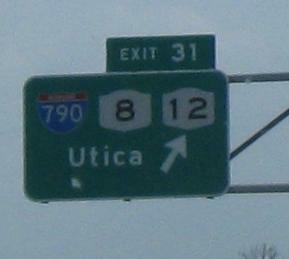 The exit connects with Genesee Street, while I-790 also connects with Genesee, ending a short bit to the east. Westward, I-790 multiplexes with NY 5 to NY 8/12, and soon dies amidst the confusion, never having met its parent. Once this was WB west of Fultonville, now it is no more. Courtesy John Krakoff. Jiminy Jillickers, this sign predates paint! Maybe the paint's just gone, but this shield is still on Nott St. in Schenectady, WB at Erie Boulevard. Click for super-road-geeky closeup. Both EB, both courtesy Doug Kerr. 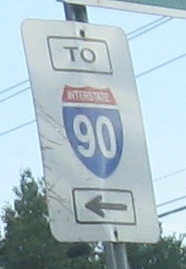 I-90 approaching the end of its run on the Thruway. Exit 24 is the southernmost mention of Montréal in the US as far as I know; I-89 and US 7 in VT don't have such a mention until much farther north. Note the perfect Mass Pike shield, which may have been commissioned from the Mass. Turnpike Authority (or at least from their spec book). 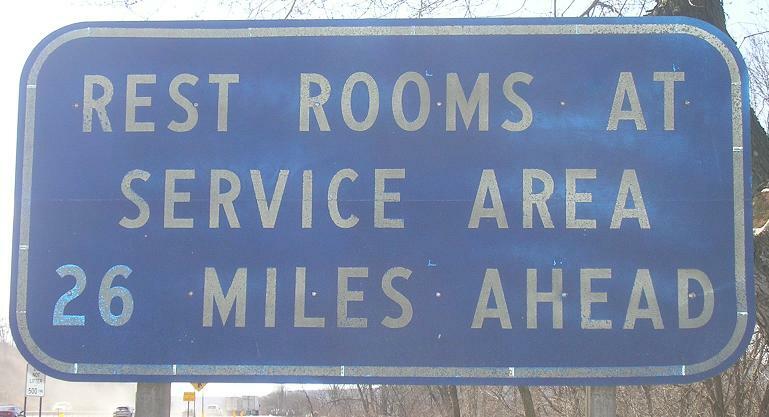 The signs lie to get you to pay more; stay on I-90 and enjoy a cheaper ride. This is I-90 EB and I-87 NB - exit numbers follow I-90 because I-87 was never supposed to come this way, but Exit 1 for one highway is Exit 1 for the other anyway; it's just that I-87 must exit off itself with this numbering scheme. The rest of the Northway is signed to US 20, where it ends for now. 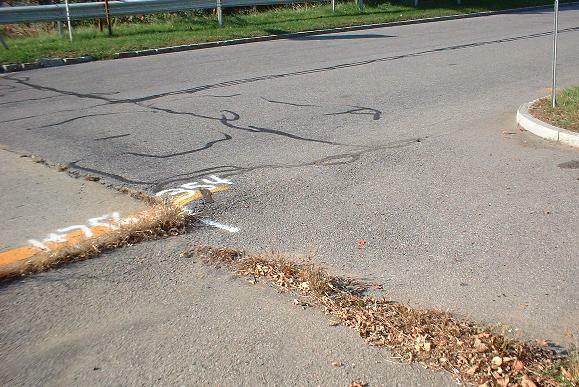 Eventually, an E-ZPass only extension might be built to turn I-87 into a continuous freeway. 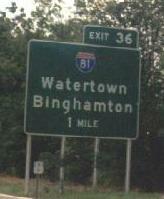 When the New York Thruway was built, I-90 was supposed to follow the Berkshire Extension (off the Mass. 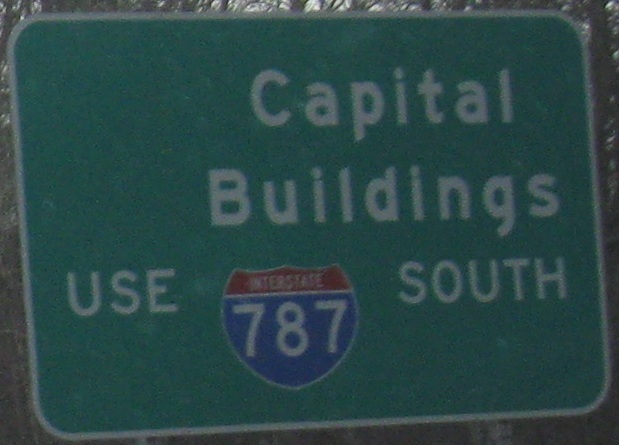 Pike) onto the mainline, multiplexing with I-87; I-87 would have left in the vicinity of I-787, paralleled the Thruway for a short distance, and then run onto the Northway. 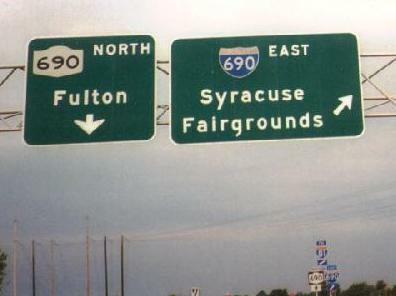 Instead, an eastern bypass of Albany was built to the Berkshire's exit B1, and that became I-90, allowing a brief moment of free passage between two tolled roads (unless you take I-88 to/from I-90, in which case you don't pay NY one cent of toll). The Northway was never completed south of US 20, so I-87 was brought off the Thruway at the same place I-90 comes onto it (Exit 24), which heavily favors I-90 traffic. Because now suddenly a lot of through traffic was using a tight loop, measures were taken to widen the interchange, and a flyover ramp was built at the I-90/I-87 interchange just to the east, but still I-87 traffic is getting the raw end of the deal. 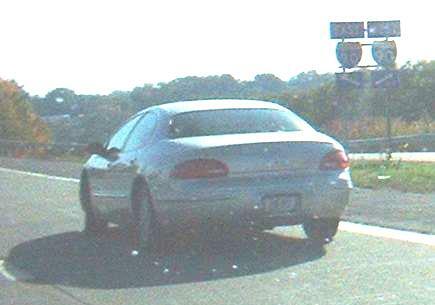 The Northway runs smack into US 20 and ends at a traffic light. 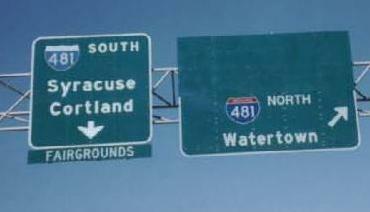 Both the Thruway and Northway are therefore briefly unsigned reference routes. WB, same spot, 1977 courtesy Michael Summa. I-90 WB and I-87 SB after the tollbooth; you can follow either one onto the Thruway, which bends sharply from N-S to E-W here. The two signs look much, much different - look at the arrows and the directions. Typically ugly mall sign, Crossgates Mall Rd. at a connection to Washington Avenue Extension EB. 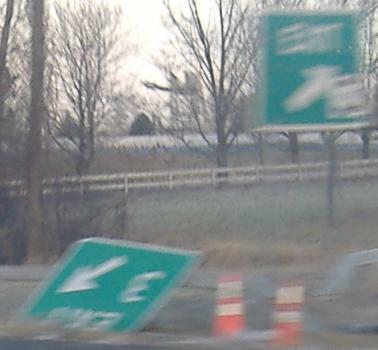 This westbound gore sign fell or was knocked down, but rather than remount it, NYSDOT put up a replacement sign sans exit number, and rather than even remove the old one to a safer place for remounting, it's out there on the shoulder. There must have been a logo in the upper left corner, because the justification of "Capital Buildings" is just silly. Also, every building in Albany is a Capital Building - perhaps "Capitol"? The bubble shield also contributes to the ridiculousness. Exit 5A from I-90 EB, onto what looks like an expressway. It has the same box girder rails used in all freeway construction at the time in NY, after all. This is Corporate Woods Boulevard, but would have been I-687. 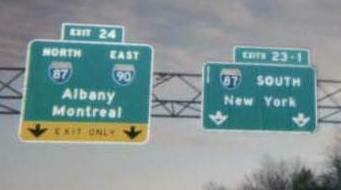 It would have extended to the north and west, up to I-87, creating an effective bypass of downtown Albany. Instead, the concrete-paved interchange, sized for six I-687 lanes but striped for four (the ramp from WB I-90 is a one-lane ramp of two-lane width), suddenly turns into a boulevard sized for four lanes and striped for two. Where the concrete of the full-freeway interchange abruptly ends and the grass-median boulevard begins. The new guiderail tapers off of the old here as well. Coming back east toward I-90. The I-90 shield on the left was state-name, but sun glare wipes it out and they're gone now. You can see that two lanes flow for the EB movement - they join three lanes on I-90 after a very high-speed curve (55 MPH possible, signed for 45), telling how much traffic was expected to use this ramp. Between Exits 6 and 7, and thus without a legitimate exit number, WB in 1977 courtesy Michael Summa. It should be 6A, because it's really not cool with the FHWA to leave exit numbers unsigned. I-90 EB joins the Berkshire Extension of the NY Thruway with alternating colors of chevrons, a Thruway original idea that doesn't meet national standards. 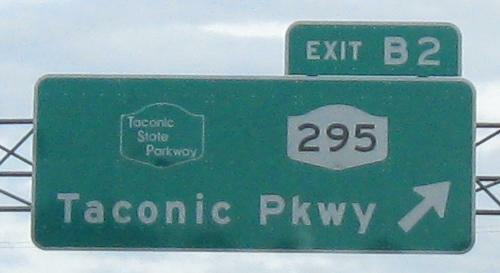 EB and WB, the beginning of the Taconic State Parkway (which is conveniently its own destination). 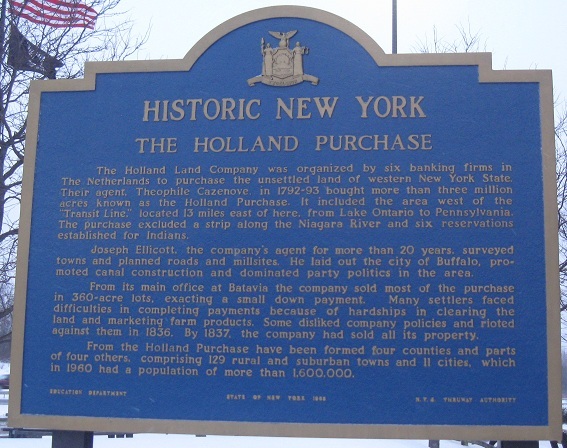 Notice the NY-standard Parkway shield, with the green-on-white scheme, except in the daytime photo you can see it has the wrong font. There should also be some sort of shield background to visually segregate sign and shield. Also note that NY 295, which crosses the Berkshire Extension (I-90 at this point) immediately to the east, is neither the Taconic nor I-295 - NY gets away with dual numbering by making one NY 295 and the other NY 295I. Just like on Long Island parkways (where so many are so close together that the same exit numbers would cause confusion), these exits have letter suffixes, in this case to allow a single ticketing system that won't confuse B1 for 1 - even though exits 1 through 15 are not ticketed.